You are here: Home / Sir Jason Winters Blog / How Much Tea A Day Is Healthy? How Much Tea A Day Is Healthy? Tea, particularly green tea, is full of health benefits. But can you have too much of a good thing? It turns out that yes, you can. While drinking green tea is bound to give you health benefits, too much of the wonder drink can begin to have negative side effects on your body. Though these side effects are hardly serious. It’s important to know what happens when you drink green tea. The benefits to drinking green tea are numerous, and you can pile on the benefits by adding cups of green tea to your daily routine. One benefit to green tea is caffeine. You might not feel the effects of caffeine from one cup, and that’s generally a good thing. A little bit of caffeine can help your metabolism work faster. Because green tea has much less caffeine than drinks like coffee, you’ll be safe having more than one cup of tea. Another benefit to drinking lots of green tea is hydration. When you drink tea, only a small percentage of it is actually tea – about 0.4% – while the rest is water. Most people are chronically dehydrated, so adding tea is a clever way to drink water while getting great flavor and health benefits. Too much tea can cause slight problems; fortunately, they are hardly serious. One common issue with drinking too much tea is the caffeine intake. Caffeine is good in small doses, but too much caffeine can change the way your body works. You can start to become addicted to caffeine, and you stop naturally producing energy. You’d have to drink a lot of tea for this to happen, and unless you’re drinking more than 8 cups a day, this isn’t something you should be worried about. Another thing to consider about tea is what you add to it. Green tea on its own is relatively harmless, but other herbs added to the mix can change that. Your body will react differently to some herbs, so it’s best to avoid large doses of anything you don’t understand well. Sugar and honey help tea taste even better, but they can add calories and start to counteract against the weight loss properties of green tea, so best to use them sparingly or not at all. Aside from these, there really aren’t many problems to be concerned about. If you want to get the maximum benefits of green tea, you’ll want to drink up to 6 cups a day. That might seem like a lot to some people, but you’d be surprised how quickly you get hooked on the flavor! 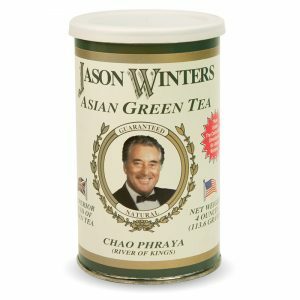 The 6-cup rule works well when you drink high-quality green tea like Sir Jason Winters. There really isn’t a huge drawback to drinking too much tea, but you can get plenty of benefits from adding a few cups to your daily routine! https://sirjasonwinters.com/wp-content/uploads/2017/05/drinking-tea-1.jpg 2359 5760 Michael Austin https://sirjasonwinters.com/wp-content/uploads/2016/04/logo.png Michael Austin2017-05-15 19:47:082018-10-17 13:31:27How Much Tea A Day Is Healthy? What’s The Best Time Of Day To Drink Green Tea? So Which Sir Jason Winters Product Is Perfect For You?